It’s been some time when I post last library. Next one is internal RTC library. STM32F4xx devices have Real Time Clock (RTC) inside, with support of internal calibrated 32768 Hz oscillator or external (more accurate) 32768 Hz oscillator. RTC peripheral has also backup register support, which means that when you reset MCU, registers are not reset or if power is off and you have battery connected on Vbat pin, clock is still working. RTC can also wakeup MCU from all powerdown modes. It has interrupt connected to EXTI lines which allows him to do that. As of version 1.1, you can now also wakeup MCU with alarm interrupt. This is now supported in library. Library also provide converting time to epoch time (seconds from 01.01.1970 00:00:00) and back. RTC peripheral has 2 between independent alarm sources which can trigger an interrupt once a week or once a month according to its settings. I have made a little explanation down, but you will see how to use it in example 2. STM32F4 has internal 32768 calibrated oscillator, which is not so calibrated as it is maybe heard. For any clock accuracy, you need external clock source. For this purpose, you can connect external 32768Hz crystal. Time structure is used to work with time. These are options which you use when set or get data from RTC. RTC can work with internal or external oscillator. Remember: Internal RC oscillator (it says that is calibrated) is not accurate at all. It failed about 2 seconds per minute on my both discovery boards. Use external clock source. Wakeup with RTC is also possible. Below is structure where you can set every x seconds interrupt will happen. On power on, you have to initialize RTC peripheral. 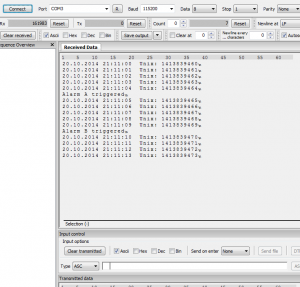 This function enables clock for RTC, synchronize registers and prepare RTC to work. RTC is set to 01.01.01 00:00:00 on power up, if it is not configured before. If time is configured and reset happen, time should stay as it was before reset. To get data from RTC you also need to have initialized time struct. Then use it like when you set date and time. I also made a function which calculates seconds from 01.01.1970 00:00:00. Note: When you call function to get time from RTC, this function is also used to calculate time and store it in unix member of time structure. Let’s say, that you are working on project where you have to save your time somehow. If you save date, month, year… separatelly, this will take a lot of bytes. 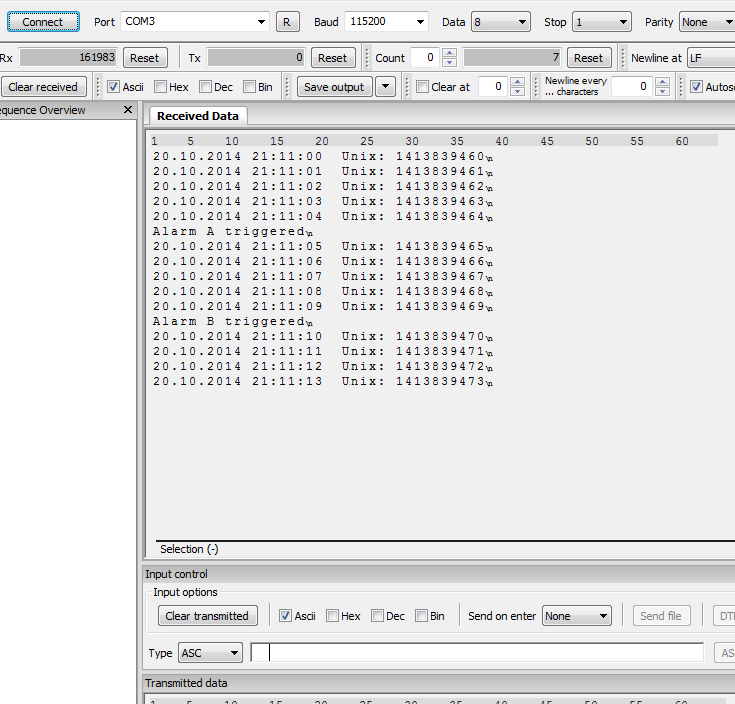 If you convert time to seconds offset from 01.01.1970 00:00:00, and save it, that takes 4bytes, which is smaller. But than you have to get time back from this seconds. This is doing function below. It converts seconds from 1970 to a human readable time. RTC peripheral on STM32F4 has capability to trigger 2 different alarms, Alarm A and Alarm B. They can be set, to trigger interrupt one time in a week or one time in a month. Also, they are completely independent between each, but they have interrupt handler in common. You are of course able to set one alarm to be triggered each month and one to be triggered each week. By changing these two values, you can set your custom prescaler for RTC, but result should always be one. This give us now 1/1024 of a second resolution. Subseconds are read from RTC registers when you read clock. I have also made some modification to library, which now allows you to custom set values for ASYNC and SYNC. If you need to calibrate your RTC crystal, you can set them to match your crystal frequency. When you set this new library, you have to set date and time again, or your settings will not be valid! * Date in string format. Example 4 shows you how to use this. RTC features 20 internal backup registers where you can store anything and will be available whole time RTC is active and has power. My library uses backup register 19 (last one) to store informations about library, so you are not allowed to store data there. This is also prevent using my functions for that. I’ve made 2 functions for this. Look at example 5 how to use this. * be available all the time RTC is running and has power. * and is not available for USER to store data there. Below are listed all functions and enumerations used in this library. In new version 1.1, alarm is supported. How to properly use it, look at example 2. * 1 - 31, representing days in a month. * Stored date and time format, can be binary or "binary coded decimal"
Why is RTC not updated on read? When i developed this library, I found somekind of a bug on STM32F4 RTC peripheral. If I first read date register and then time register, date was not correct updated on read. If I turn this arround, so first time, then date, everything was perfect. Wakeup interrupt is triggered each second. After trigger, date & time is read from MCU and displayed over USART3 to user. If you press button on discovery boards, date & time is set to some other value. Example below works the same as example 1, just subsecond is added to USART output. Projects are available at Github, download library below. Previous story USART Library has been updated!